Hello and thank you for choosing to stay at my condo in beautiful Whitefish Montana! 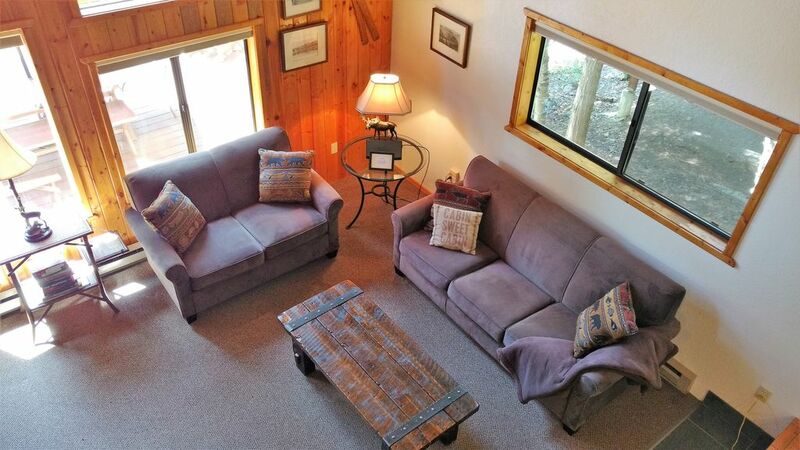 I love Whitefish and Montana and have put alot of effort into making my cabin comfortable and enjoyable for my guests. I hope you enjoy your stay and have a memorable vacation! I also own vrbo 410475 - 99 ELKHORN and vrbo 01893 - 61 Bitterroot if this condo is not available, check those out! My brother introduced Montana to our family when he enrolled at the University of Montana in Missoula several years ago. We have been visiting and vacationing here over the years. In 2002 I decided this would be a great place for a vacation property! The location is perfect. A quick drive to Whitefish Mountain and also close to town. The beauty and peacefulness of being right in the mountains and enjoying the wildlife. Reading by the wood-burning fireplace. Skiing, snoeshoeing, mountain biking, and hiking are a few of my favorite activites that can be enjoyed right outside the front door! The new pool and hot tub which is walking distance away are very relaxing and enjoyable! The outdoor pool is wonderful and refreshing in the summertime. A private beach on Whitefish Lake for Ptarmigan owners and guests. Glacier National Park is one of my favorite places to hike in the summer and is only 30 minutes away! Whitefish Mountain has a few new rides: Zip Line, Alpine Slide and Walk in the Treetops which are fun too. And sometimes it is nice to go huckleberry picking and take a walk up the mountain and enjoy the beautiful views....which is so close by. A few of the unique features of my condo are:brand new VERY COMFORTABLE BEDS, IN UNIT WASHER & DRYER, WOOD-BURNING FIREPLACE. FULLY EQUIPPED OPEN KITCHEN WITH LARGE ISLAND FOR ENTERTAINING. LARGE DECK WITH TABLE & CHAIRS, GRILL AND BEAUTIFUL SCENERY! BRAND NEW 1.3 MILLION POOL BUILDING WITH SAUNA, CHANGING ROOMS AND SHOWERS. This was one of the nicer units we've rented in Ptarmigan, it was close to pool and had some nice features like the large bar in kitchen and upgraded bathrooms. Cozy and clean, we had a nice stay. Very Comfortable, full sized kitchen, stocked. Beds were also very comfortable. Good location. We really enjoyed our stay at the condo over New Years and loved having a hot tub to soak in after skiing that is just a block or so away! The heating system was adequate. The fireplace was hard to keep going at times and puts out minimal heat but was great for the ambiance at night. The owner responds right away and is very helpful! Would recommend to others!! Clean condo with great amenities! We loved our stay! We were very impressed upon arrival at the cleanliness of the condo. The location can’t be beat! Sharon was so easy to communicate with and always replied with in a couple of hours. I would recommend this place for any family getaway! Comfortable, cozy condo in a beautiful location. Very comfortable for 5 adults. We especially appreciated the kitchen, which is nicely stocked. The knives are sharp, which is very rare in rental properties. We saw deer and a great horned owl from the deck. We really liked the place, but we didn’t have much time to spend there, basically just slept there, wished we could of had more time.